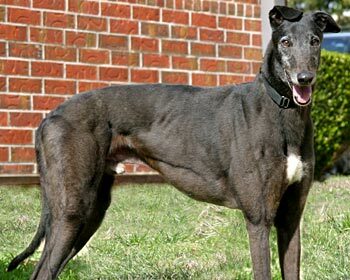 Shiner, aka Spit Shine, is a handsome, 7-year-old black male born July 26, 2003. His sire is Fry That Spam, and his dam is Greys Starshine. Shiner started his racing career on February 5, 2005 at Gulf Greyhound Park at La Marque, Texas, moving to Corpus Christi track and finishing there on September 21, 2005. 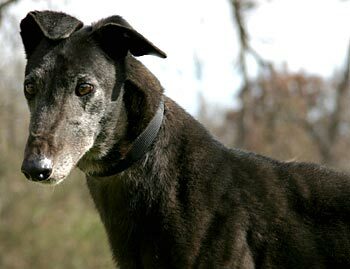 Shiner was brought into GALT’s family with a closing of a greyhound farm in south Texas. He is one sweet, affectionate boy! Shiner is not cat tolerant, and he has not been tested with small animals at this time. Shiner is the sweetest boy you could ever know! He loves to get some attention from us and then go and lay down for a nap. He fits right into the pack and yet at the same time he is just as happy being upstairs on his own. At night, he sleeps near us on a dog bed. Shiner isn't shy, but he does have a calm, laid back personality. He does have his playful moments too, especially with toys. He'll get the stuffies out to play with from time to time, and he's quick to find the squeakers! He crates well while we are gone, and rides very well in the car when he gets to go with us. He's quite the gentleman on leash. He loves outings and if he suspects I have my keys, he'll follow me around the house hopefully. Shiner is not at all tolerant of cats, and would do better in a home without little dogs. But if your house if free of small creatures, this could be just the happy, dignified boy for you!